Archangel Michael Protector of Love and Joy connects in this new free .MP3 angel message. Relax, Breathe, and Listen as Archangel Michael will first assist you in clearing and lifting your vibration, and then in downloading a new level of Divine Joy and Love into your life experience. and lifts you in vibration to inspire more joy, love and happiness from within. Learn more about Archangel Michael here. Simply right click (Ctrl Click Mac) the link above to download this angel message with Michael to your computer. Beloved one, indeed, I, Archangel Michael, greet you in this very now and say to you all is well. Know that once again you have reached a powerful point of new beginning which through your thought, through your vibrational energy signature, and through your intention, you are able to embark upon a new journey, you are able to consciously cocreate with divine love to bring a new level of joy, of vibrant well being, of health, of abundance, and love into your life. To prepare you for this new journey you are embarking upon, we angels surround you now in the vibration of unconditional love and joy. Know that love and joy are the most powerful vibrations in the universe and simply calling these vibrations in, surrounding your energy with love and joy, will not only uplift you and bring new positive experience into your life, but love and joy will actually protect your energy, your mind, body, and spirit from absorbing unwanted, unwarranted negativity, doubt, fear, and lower dense vibrations from others, and from your world. It is true, there are still dense vibrations present in physical form. Perhaps even present in your personal energy signature. But as you are supported now, you can let this go for right now, but it is true, you may need to do release again in the future. For as you go through your day to day life, you may absorb toxic vibrations, you may absorb doubt or fear based thinking from others, perhaps from someone you have not even met or had a conversation with, but simply walked past. As you are a sensitive, energetic being, and as you are connected to all that is, your energy naturally co-mingles and combines with those around you. And so you see, by staying in a vibration of joy and love, you are protected, you are unable to absorb negativity from others when you are in joy and love. But it is when you slip a bit, it is when you yourself engage in doubt or fear based thinking, you become like a magnet thereby attracting these dark or dense energies held in others. And then suddenly a small fear or doubt that has crept into your mind is compounded from the fear and the doubt present in the collective consciousness. When you are in a doubt, it is like opening a door, it is like putting up a flag which signifies doubt is welcome here. This is why we say to you often; stay in joy and stay in love for then your flag says love is welcome here. Joy is welcome in my reality. And this vibrational flag, when you are in joy and love goes a bit further. It prevents negative energy from entering into your life and there are many benefits in this. And so you see, dear one, right now an orb of joy and light surrounds you. The feeling of being love, the feeling of being joyful. Enter inward now. Notice this orb forming around you and at first it may make you feel a bit uncomfortable, for joy and love entering into your aura and into your mind, body and spirit push out now all dense, heavy, dark, grey, ugly, sad, fear based thinking and doubt. All these heavy vibrations that you have absorbed are now released. Let them go, let them go into the light. The amazing thing about joy and love is there is no limit to the power. There is no limit to joy and love. And so now as dense energy is released, this orb of joy and love around you, becomes strengthened even more. We flow more and more joy and love and light, high vibrations from the angelic realm your way to cleanse you, to lift you. Breathe and relax. Imagine that as you breathe in, joy, love, and light fill your body. And as you breathe out, this same joy, love, and light fills out your aura. As you breathe in now, imagine that joy, love, and light pour into your mind so that your mental body is now cleansed, so that doubt and anxiety and fear that are yours or that has been absorbed from others, is released. Let go of density and now more joy, love, light, compassion, and well-being fill your energy signature, fill your aura. We speak of energy signature, for it is important for you to understand that the thoughts you are having, the beliefs, the experiences you have do not happen and then they are done. The thoughts that you have continue to spiral around you in your energy signature until you consciously change them or until you come in contact with another, and from that interaction your energy may be improved or uplifted if you come in contact with someone who is joyous and loving, who has an auric shield of joy and love. In this instance you will be benefitted in a positive way. But when you are required to talk to or perhaps even to walk by someone who is a negative vibration, this interaction too can have an effect on you. It does not have to, and will not if your auric shield of joy and love is strong and intact, but as I mentioned earlier, if you yourself have a bit of doubt creeping in, this magnifies, this draws the doubt of the other, it opens the door for more of this which you do not ultimately want to be woven into your energy signature. And so from one interaction, your vibration can shift. But, you see, you have the choice at any time to call in your angels, to call in, I, Archangel Michael. And, you see, your every interaction impacts your energy. And so when you call in angels and say, “Take this heavy vibration away from me,” which we do now and we release it into the light and we flow joy and compassion and light your way, you are able to feel uplifted, you are able to return to centered state of being, you are able to return to love. Your interaction with angels can turn the page, can help you to shift your vibration even if you have just spent 10 years with the most negative person you can think of. Call in your angels, call in I, Archangel Michael, and simply think or say, “Help me. Take this negativity out of my aura, out of my mind, body, and spirit and release it into the light. Help me to tune into the love of the universe that is present, help me to tune into the joy of the universe that is here,” and we will. We flow on strands of light now joy and love your way. Let these in by simply thinking, “Yes. Yes to joy and yes to love,” as your energy signature is now realigned for the highest and greatest good and attuned to divine love and joy which serve you, which protect you, which bring you into alignment with manifesting positive blessings in your life. You are, you see at a powerful point of new beginning now, with joy and love in your aura and in your energy signature, as you intend, as you plant the seeds of intention and begin to embark upon your new journey, joy, and love will usher in the positive blessings you seek. Yes, there’s action that is required on your part, but understand that following the path of joy and love will make even knowing what actions to take more clear and will make your actions more powerful. Let joy in, let love in, let these lift your vibration for we flow them your way now. Let this interaction with the angelic realm now be a turning point for you, let it be an awakening, let this interaction inspire you to remain in joy and love and then, you see, in your encounters with others, you can inspire healing, blessings, joy, and love in their life by simply maintaining a positive vibration of your own. “I am in a negative thought pattern. My energy signature is not as centered in joy and love as I would like.” And with this awareness, you can change it instantly, immediately by simply calling in your angels. And if you ask this with sincerity, if you desire this, you will see the benefit, we will assist. And know that you have this ability. The important thing to remember is to center, to return moment to moment, time and time again to the still, to the silence, to the calm found within. It is the stillness that connects all that is, and so connecting with the still and the calm is healing, brings you clarity and well being, aligns your energy so that you may make the connection with divine love. “Angels connect, lift me up, help me tune into a new level of love, help me to experience more joy and raise my vibration”, and so it is. We are happy to do this for you always as we have done now. Know that your energy has been cleared. You see, this is easy for us. 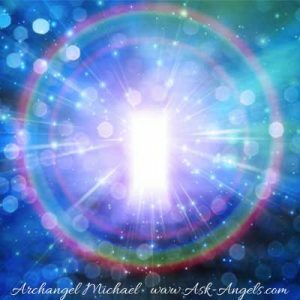 So do not hesitate to ask, “Archangel Michael, cleanse my energy. Help me to release negative thinking., cut any cords of negativity which drain my energy” It is within my capacity to do this for you and more when you ask. Of course, I will honor your free will. I will not interfere in your life without your permission. But if you desire more joy, more love, more health in your life, intend and know that the stars are aligned. All is aligned right now for you to co-create with the divine to bring a new level of love and joy into your life, to inspire your life, to shift away from simply doing what you ought to do and stepping into what you are inspired to do. Do you see the difference? One, what you ought to do, serves others and perhaps even serves the world. What you are inspired to do serves all, all life, all humanity, all creatures and earth. And this inspiration does not come from the logical or ego mind. True inspiration and knowing of your path can only come from within, from the silence we speak of, from the still, from the calm, from your open heart. And so take in a deep breath of love, joy, and compassion which lifts you in vibration. And when you breathe out let this love, joy, and compassion fill out your aura, strengthen your protective shield, and lift you in vibration even more. Love and joy serve you always. Invite them in, nurture them, notice the things that you love, notice the activities that bring you joy. With awareness you can know this and then with awareness you can act. Make joy a priority. Make having fun a priority. There is always work to be done, there are always chores. There are always duties and obligations and you have time for these all. But you have time for fun and for joy as well. Nurture love and joy and love and joy will nurture you. These forces of the universe will propel you forward to accomplish your purpose. Joy and love are a guide. Pay attention to what brings you joy and keep moving in this direction. And what do you resist? What is not fun? What is challenging? Let it go. Let it go. And return to love, to well being, to joy, and call upon we angels. We are always near. We will assist you directly or we will assist you in lifting your vibration so that you may directly connect with source, with God for yourself as there is much benefit in this also; much healing, much joy, and much love. But for right now, before we part, we assist you in releasing any beliefs which block joy and love from fully entering into your life. And now download you with the divine mind, divine body, and divine spirit centered in joy and love. Let these in and freely share your joy and love with others and they will continue to grow, and build, and attract unlimited blessings for you in your life. This is no stretch. Joy and love are powerful. Nurture them and watch them grow. I, Archangel Michael, leave you now with my blessing. You are so dearly loved and you are downloaded with the feeling of joy and the feeling of love. Carry these into your life. Nurture them. Let them grow. They will serve you always. You are so loved. If you enjoyed this meditation, click here and listen to the love meditation, next! When am I going to be happy and content? Thank You Archangel Michael. God Love always infinite. Thank You Melanie for channeling this message from Divine Angel. Thank you for the lovely meditation! So beautiful….thank you for sharing this inspiration of love and joy. Looks like my journey in here has not been in vain…..’Thank you’!! ThankYou Archangel Michael for being there for me., and bring towards the light . Help me to stay on the right track.